Icy's Blunt Pencil: The Guns of Retribution launch! Thursday night saw the first launch party for The Guns of Retribution! I hired the back room of Bob Trollop's, a small pub on Newcastle's Quayside, a room I chose based on the preferences of Grey O'Donnell, the protagonist of Guns. I know that probably sounds extremely weird, but Grey does make his presence felt from time to time, most notably while I was writing the book (see here for more) and he's even come through on a ouija board during a paranormal investigation to say hello. It only seemed right that I chose a location I thought he would like, and Bob Trollop's has something of a vintage atmosphere. The back room in particular is vaguely reminiscent of a saloon, or perhaps an illicit bar in a rundown homestead out on the open plain, attracting outlaws and farmers alike, as they seek the solace offered only by Madam Moonshine. Indeed, the front room of the pub inspired an entire scene in the sequel. Well luckily I managed to sell some books, and naturally sign them, and I really hope those who bought them enjoy the books! The book has been getting good reviews on Amazon and Goodreads, and I hope that those who enjoy pulp fiction will enjoy the book as being exactly that. I really enjoyed the night, and look forward to being able to introduce Grey to more people! If you haven't already bought a copy and would like to, it's available for both the Kindle, and in paperback. Amazon US links are Kindle and paperback, and UK links are Kindle and paperback. It sounded like the perfect place! 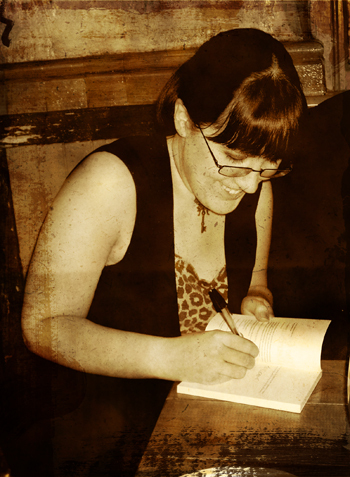 and I love that photo of you signing your book!